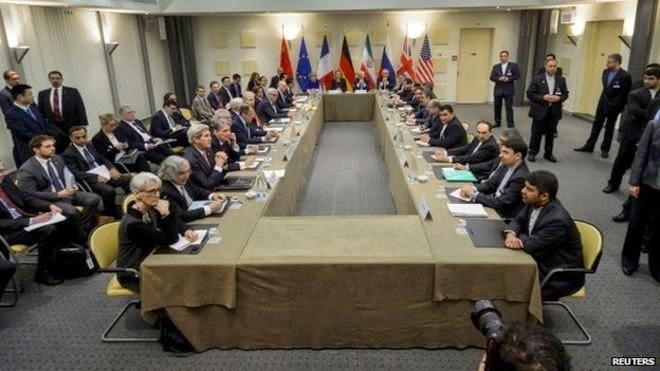 Reports from Lausanne indicate that the crucial round of nuclear talks are going down to proverbial wire. Diplomats speaking to reporters say “some quite important gaps” still remain. Two apparently main disputes continues to be the sequence of lifting of sanctions, and what kind of nuclear R&D Iran can still pursue. The issue of disposal of Iran’s current stockpile of enriched uranium has also not been resolved yet. Iran said on Sunday that it will not ship out the stockpile to Russia, as has been suggested in the past as a viable solution. As Russian deputy foreign minister told reporters today, all parties have the intention to reach a deal. But they need to make tough decisions by tomorrow. Lausanne: The United States will have to take a "hard look" at its options if a looming deadline to reach a nuclear deal with Iran is missed, a senior US official said Monday. "I don't want to predict what the outcome will be," acting State Department spokeswoman Marie Harf said, asked what would happen if there is no agreement on the broad outlines of a deal by a Tuesday midnight deadline.